As a new and mysterious, algorithm-driven field, there are many questions about how app store algorithms work and how to optimize your app listing to gain more visibility and drive more downloads. Today’s article provides answers to some of the most frequently asked ASO questions based on Quora threads, Google searches and conversations with our clients. In a short, ASO is the combination of SEO (search engine optimization) and CRO (conversion rate optimization) for the world of apps, focusing on optimizing your app’s listing for better results. ASO is like SEO in that the goal is to be found for as many relevant keywords and places in the app store as possible. For visibility optimization-work, the number of store impressions and product pageviews are important metrics of success. ASO is like CRO in that the goal is to convince as many visitors to download your app as possible. For conversion rate optimization-work, pageview-to-install conversion rate is an important metric of success. App store optimization begins by creating your app listing (title, description, screenshots, etc.) in either the App Store and continues by tweaking each of your app listing’s elements in order to maximize your visibility and ability to convert visitors into users. ASO is most commonly thought of as finding and using the right keywords and text/visual listing elements, but it can also encompass push campaigns, review flow optimization and getting an app featured, all of which positively influence views and installs. How does the App Store algorithm work? First – the category or top chart ranking algorithm (free, paid and grossing) is much simpler than the keyword ranking algorithm. App category ranks improve with more downloads (free or paid) or more revenue from purchases (grossing). While the exact calculation in terms of installs or purchases volume to rank is unknown and varies between categories (e.g. photos and video vs weather), but it is logarithmic (i.e. moving from rank 1000 to 500 is much easier than from moving from 10 to 5) and the most important factors are installs or purchases. Apps will first achieve a rank in their category or sub-category (e.g. #1500 entertainment apps), followed by their country (e.g. #1500 US overall). The initial factor of the keyword ranking algorithm is whether an app is relevant for that keyword or not. Without being relevant, you app is even eligible to show up (i.e. Facebook is the most popular app but only shows for a certain set of relevant keywords). Relevancy is determined by several factors including those in question #3 below. For all apps that are relevant for a keyword, each is assigned a keyword rank score that changes with each user interaction (e.g. pageview, install, purchase). An app’s keyword rank score is updated with each interaction and either goes up with positive engagement (e.g. a click, install or review) or goes down with each negative engagement (e.g. an impression but no click, pageview but no install or uninstall before the app is ever used). Apps compete with one another to rank for keywords and when one app’s rank score for a keyword becomes higher than the score of the app above it, it will move up one spot. Engagements are sourced back to each keyword that the user came from, meaning that scores are different from each keyword. That said, engagements for an app overall will improve its ranking for all relevant keywords to some degree, meaning that if Facebook were to become eligible for a new keyword, it would likely start at a very high ranking. The keyword ranking algorithm is also logarithmic and most installs come from the top 10 ranked apps for a keyword. Additionally, if a keyword is removed from your app listing (e.g. keywords space), you typically will become immediately ineligible to rank for that keyword. How can I estimate the volume for each keyword? ASO tools – these will provide you with a search volume score, which indicates the popularity of a keyword;These tools compile data from several sources including their proprietary databases, the google keyword planner tool, store autofill results and trending keywords. App Store Autofill Results – by typing a keyword into the search box you can see the most popular keywords that include that word, such as “free (games, music download, music”). For keywords that are popular enough in the app store, related keywords will also show at the top of a search done from an iPhone or iPad. Google Keyword Planner Tool – this handy, years-old tool provides data on what people are searching on Google.com, which while not the same as app store searches, provides generally applicable search trends. Google Trends – this tool allows you to see the popularity of a Google search trend by country or state. While keywords must have significant volume to show up in Google Trends, Trends can help visualize the popularity of a search trend over time better than the keyword planner tool can, even providing data by the hour. What kinds of ASO tools are there? Supreme Media provides expert ASO services with the biggest dataset and the best keyword search preview UI, capturing significant and store-wide changes in rankings and optimizing keyword density in an app’s listing . That’s all for today! Thanks for following along – happy optimizing! The case has been well laid out for why you need to localize your mobile app for Android and iOS. Not only will you increase your ROI, worldwide sales and growth, but you’ll be assured access to continuous new customers from developing markets. So, you may have some idea of how to start your app localization. But how do you make sure that you do it correctly? How do you make the most of your mobile app localization to raise your visibility in the App Store, increase downloads and create an optimal user experience? Get it touch with our mobile experts here! With a staggering 1 billion Apple devices around the world, it’s pretty clear that you’ll need to localize your app for iOS. But Google Android’s figures are even higher, with more and more well-known brands, like Samsung and Sony, creating smartphones to rival the likes of Apple’s iPhone. Whichever system you prefer for personal use, one thing is for sure; you’ll need to be prepared to localize your app for both iOS and Android. You can do this the easy way or the hard way. You can take a platform-specific approach for both systems and make use of platform-specific tools for the localization process. But, if your app shares the same functionality and content, then it’s much more efficient to share the data between iOS and Android platforms. If you’re familiar with iOS’s XCode and its “Base internationalization” feature, then you’ll need to abandon any ideas you have of using it. If you want to avoid conversion headaches later on, it’s a lot easier if you prepare your app for both platforms from the start. Generating the right strings for your iOS app, that are correctly named and prepared, is completely useless to you if you want to use the same file in your Android app. You’ll need to make sure that you design your UI to accommodate foreign character sets, including different symbols, accents, and RTL languages. Remember that a key element when designing your UI to accommodate different languages is the issue of space. You’ll need to make sure that you leave ample room in your interfaces to be able to accommodate languages that take up more space. For example, Italian, Spanish, French, Portuguese and German take up almost 30% more room than English. You’ll need to think about this for languages that read vertically and RTL as well. Both iOS and Android have extensive resources on how to localize your mobile app to support RTL languages. Check out the advice from Android and iOS before designing your UI for these languages. You’ll find invaluable tips and requirements that you need to know, such as mirroring your interface and changing the text direction. Remember that language localization from RTL doesn’t include country codes and telephone numbers, which always read from left to right. Providing an optimal user experience in all your target languages is imperative if you want to increase downloads and app adoption. If your design appears broken, the text goes outside of the lines, or simply doesn’t read right in their language, then with just one tap of their fingers, it will be deleted. Some 77% of users never use an app again after just 72 hours of downloading it. Be part of the other 23%. Make the most of your mobile app localization project by creating a positive purchasing experience for buyers in their own language. Carry out the extensive research you do in your home market overseas. Know your foreign customers’ tastes and preferences. After all, you create a positive purchasing experience for your buyers at home. You optimize your content, make use of social proof on your website, are active on social media, and maybe even use influencer marketing. You offer competitions and engage your customers on your home turf. So, why wouldn’t you do your very best to provide the same satisfying experience for your foreign clients? If they don’t feel like you’ve studied the market (if you haven’t, in fact, studied the market) then they won’t download your app. They won’t even find your app in the first place, if you don’t optimize your translated content. So, whatever you do at home to create a positive purchasing experience, make sure you mirror that in your target language markets as well. Localize your texts and images appropriately to ensure adoption in different cultures. Make sure that prices are displayed in local currency. Think about dates, weights and other measurements. Appeal to your customers through targeted social media campaigns. Adapt your offers to meet different legislation and to cater to diverse cultural nuances. Make it worth their while. Mobile app localization is a big task. From original design concept, to extracting and converting files, translating texts and localizing icons, colors, and images. You need a strong team able to work well together across different disciplines. Whether you decide to use the services of an external consultant for your market research, or conduct investigation in-house; you’ll need to know how to utilize the data efficiently. Programmers and developers must be aware of their roles, and be able to communicate well with the translators and product managers. If you’re hiring a specialist for help with content optimization and different search engine requirements; make sure that they communicate the keywords to the translators. The best way to ensure that your localization team works harmoniously together is by using the right translation management software. Your programmers should be able to upload screenshots for translators and provide context where needed. Your product managers should be able to tag people and leave notes and requests that can be seen by everyone. You need your team to be able to collaborate openly and easily, to ask and answer questions or express concerns. To make the most of your mobile app localization, you’ll need a united team who can see the project through from start to finish, so that when your app is ready, it doesn’t disappear into the sea of similar apps already existing in the App Store. App Store Optimization should never be an afterthought. You should be layering in your keywords and optimizing your localized texts from the beginning. Once you’ve discovered the most popular search terms in the country of your choice, make sure that you use them. Think about the name and description of your app and how you can utilize keywords and phrases to ensure maximum visibility and downloads. If your app is about finding the right vacation destination, remember that in England and Australia, they’ll be searching for “holidays” or “getaways.” If you’re offering a better solution to time management for Canadian customers, remember to keep in mind their spelling of English. Seemingly small mistakes in your ASO can make the difference between your app being a hit, or sinking like the Titanic. Keep in mind the importance of your app’s icon from the start and how it will look on both systems (and at a small size). Try to avoid adding text to your icon, as it won’t be readable and may get lost, or end up looking unprofessional or blurry. Your app’s icon will probably come up at various stages of the localization process, and that’s because getting your icon right is vital. When you’re localizing your mobile app for Android and iOS, make sure your icon looks good with both rounded edges and square edges. Color is also an important factor, so make sure that your chosen one doesn’t get lost against the user’s screen, and that the icon is culturally appropriate worldwide. When it comes to selecting the category for your app, be sure to take your time. Selecting the right category is vital. It’s not always best to select the main category for your app, if the competition is fierce. A secondary category may go further towards increasing your visibility. Finally, if you really want to get the most out of your mobile app localization, then don’t cut any corners when it comes to testing out your app. Try it across different operating systems in different regions, and on different devices. Do your best to smooth out any bugs and make sure that no design is broken. If you want your app to be king of the App Store, it’s going to have to work perfectly, not just look great. Check it out here to calculate for FREE how many downloads could ASO bring to your App ! This means that the success of an app comes from understanding how your app stacks up in the search listings versus the actual search intent for all of those important keywords. It also means fundamentally understanding what users see when they search and how they are pushed from merely browsing to downloading an app. When it comes to search intention in the App Store and Google Play, just like any other platform, users are looking for specific features or solutions to a problem. What’s important, however, is that the type of features that users want on their mobile device are vastly different from what is important on a desktop computer. In essence, search intention is different. A good way to decode search intention is to look at related queries in both the App Store and Google Play. This kind of data gives you some granular hints into what people actually hope to find when they are searching. In general, users look for apps that help them with a given problem or provide entertainment. That’s why the games category is flourishing within the App Store. Although it may be counter-intuitive, advertising within a gaming app, if it is done subtly and tastefully, is not a disturbance. If anything, it actually helps users discover more relevant apps. However, when its entertainment they are searching for, timing is everything. According to Appnext’s research (see image above), the peak discovery time for iOS is 6 -11:30 pm. In contrast, for Google Play, 7-10pm is most ideal. Interestingly, data shows that in regards to late conversions, users tend to be most open to re-targeting and re-engagement campaigns between 7-9 pm when they are using apps in the utility, personalization, and casual games categories. In more specific, instructional categories, users behave a bit differently. 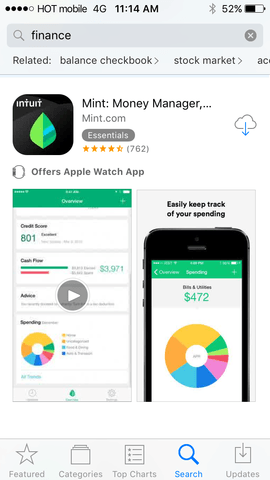 Looking at the finance category based on App Store and Play Store search data provided from March 2016, it is clear that the types of features users are searching for relate to spending trackers, personal budgeting and ways to save money. You’ll find that the words users are predominantly looking for pertain to career development. The only real overlap between the mobile data and web data has to do with managing stock portfolios and checking the markets — which is exactly what many people do on their mobile devices. With so many people talking about “page conversion” (the number of users who visit an app page and then download), it seems that the critical metric of the click-through-rate in a search listing is almost forgotten. Understanding search intention, as we discussed earlier, is necessary because it dictates how to create a search listing that users will select. Since a clear majority of downloads originate from a search query, search click-through-rate is actually the most important top of the funnel metric that marketers must pay attention to. There is no coincidence that the top search results in Apple’s App Store carry through the specific keywords and themes that users are actively searching for in the store. This practice helps them have instant relevance for a user who might spend less than 5 seconds looking at their app listing before deciding whether to click or to pass. For brands like Intuit, consumers may understand what the app is about just from brand recognition. For newer apps, however, communicating clearly what your app is all about with a smart icon, title and initial screenshot is critical for success. Too many innovative apps fail because their developers choose to have simple letters or images on their icon that are unrecognizable to end users. This practice, paired with a title that doesn’t quickly describe the most important features of an app, can be the kiss of app death. It is also important to understand that the structure of an app listing influences app selection. In the case of Apple’s App Store marketers must focus on the creative displayed in the listing. On the other hand, Google search results are more contextual, featuring a short text description. These two user experiences are very different and you shouldn’t conclude from only one and assume it will work for both stores. Now that you have read this far, you are probably thinking “this sounds like building a user acquisition funnel” — and that is absolutely correct! However, to be successful, this funnel needs to use mobile data and testing strategies specifically for both the App Store and Google Play. Think about this — if you have a travel app that is advertising ski packages in the middle of summer, there is something wrong with your user acquisition funnel. Needless to say, people are looking for summer vacations at that time. Use this same logic to cater to what users are looking for in relation to your specific app and within the category. Test and update your creative frequently, and think beyond simple page conversion. Recent stats revealed that the average American is spending 2.8 hours a day using mobile devices. 90% of that time is spent within apps. Does that mean every business needs an app? Not really. Does it mean that if you have an app, you should be striving to get it in front of the people it’s going to benefit most? Definitely. Before you think about marketing your app (or even making it), it’s critical you get the basics right. Why are you building this app? Because it fills a genuine need? Or because you’ve been told “Apps are the future (or the present)”? That last bit might be true (we already know that 90% of mobile content is consumed via apps), but there’s still little point in building an app if it doesn’t have a real purpose. If it’s an alternative to your website, but doesn’t offer anything your website does not, you might be wasting your time. It’s also key that your app is free of snags that impact usability (or as close to free of snags as you can get – there are always bound to be a few problems that don’t surface until the app’s on the market). The app closing without request (or warning). The app taking too long to respond. The app slowing the performance of the rest of the device. All marketing efforts should be preceded by a detailed strategy that includes specific, measurable goals, and a dated plan that details how you hope to achieve those goals, and by when. Pricing – what will your app cost, and how much, if necessary, can you afford to cut the price? What accompanying content are you going to create for your app? Are you going to build a microsite, or are you going to add a landing page to your current site? Who’s going to be responsible for designing and developing this content? Exactly which strategies are you going to employ for marketing your app and who’s going to be responsible for managing each of them? Who will have the responsibility of overseeing the entire project? App store optimization (or ASO) is the process of optimizing your mobile app to help it rank more prominently in the app store (or stores). Just as with internet search engines, the higher up your app appears for a given keyword, the more visible it is and, hopefully, the more people will download it. Effective ASO necessitates that you understand the keywords your target customers are using to find apps like yours. Mobile experts from Supreme Media can help you assist with this (and with most aspects of ASO). Once you know which keywords your target customers are using, the trick lies in including them in the right places – primarily, in your app’s title and description. Those are the basics of ASO. You have full control over those things, so it’s important to get them right. Number of downloads and reviews also affect ASO. This bit is trickier because you don’t have complete control; far from it. But, if you do a good job of marketing your app and include a gameplan for enticing reviews then the chances of having a higer ranking are more thereby driving more organic installs . Get the best of your apps with our ASO and Marketing Experts here !!! Of the over 3 million apps available on the App Store and Google Play, a very small number are actually downloaded and opened by users. Of that small number of apps, an even smaller number become an indispensable part of the user’s day-to-day activities. A new study from Localytics finds that one in four mobile users open an app only once. Surprisingly, these user retention rates have actually increased from a year ago (from 34% to 38%), but the numbers are still disheartening for developers. The difference between retention on Android and iOS differs depending on the report; Localytics found that iOS apps fared slightly better compared to previous years, but a similar study by Appboy found that Android apps held a slight advantage. Most interestingly, Localytics found that mid-sized apps (identified as apps with between 15,000 and 50,000) had the strongest increases in user retention compared to previous years. 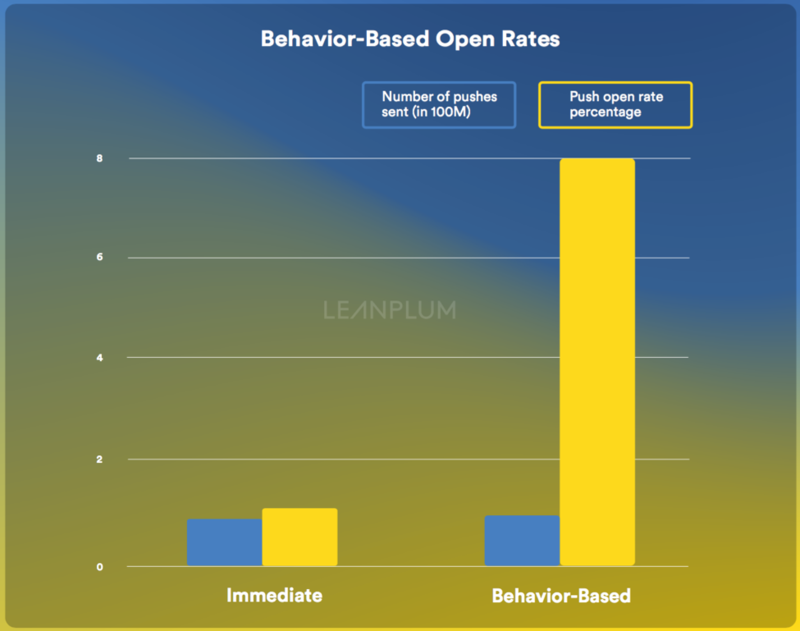 This is most likely attributed to an increased budget for retention strategies like push notifications, in-app messages, and user segmentation. Of users that see an in-app message, 17% will use that app just once; however, 26% of users who did not see an in-app messaging abandoned the app after one use. Get a free consultation on your user retention strategy with our mobile experts here ! Though gaming users are notoriously fickle, the travel app rate is a bigger mystery. The most likely scenario is that users download travel apps for one specific trip or booking and delete the app after the activity is completed. Retail and shopping apps rounded out the middle of Apsalar’s study at a 28% uninstall rate with entertainment & lifestyle apps (17%) and on-demand services (12%) at the bottom. 2) incorporating a user retention strategy before you launch will give you a leg up over the competition. More importantly, Apple and Google seem to recognize user retention is an issue for their developers and are taking some minor steps in helping them out. For Google, they announced Instant Apps at this year’s Google I/O conference. Time will tell if these strategies end up helping developers in the long term. Every Christmas millions of smartphones are unwrapped and activated while billion of apps are downloaded. Last year the number of US app installs on Christmas day was 2.5 times larger than an average December day. Although it’s a great time for app marketers to take advantage of the holiday traffic spike, this period is highly competitive. Big publishers and companies can afford to sustain high volumes of paid traffic on holidays when acquisition costs become higher. For smaller app developers, app promotion during this period can be a real challenge. Should they concentrate on acquiring high value users or utilize a volume boost campaign? What is the best time for app developers to enter this pre-holiday marketing race? Start preparing for marketing campaign by planning a budget. You may need to spend more on user acquisition during holidays. It’s a good time to start a sustainable, optimized campaign and enhance an engaged user base. Don’t forget to update your ASO tactic which will increase app visibility and make further paid efforts more efficient. You can ask your existing users to positively rate the app in stores. A one star shift in rating can increase app downloads by up to 340%, according to an Apptentive survey. Holidays are perfect for introducing a new version of your app. It can be a new holiday-themed interface, additional functionality, or helpful holiday shopping features. Make sure the app is ready for an increased number of downloads and make technical adjustments if needed. Notice that due to holiday rush, approval time at app stores can take up to 14 days. Late November is a good time to submit an app update and get it approved in time. Start a pre-holiday campaign before advertising costs increase. Add a seasonal theme into marketing activities (i.e. song lyrics, holiday visuals, catchphrases, etc.). 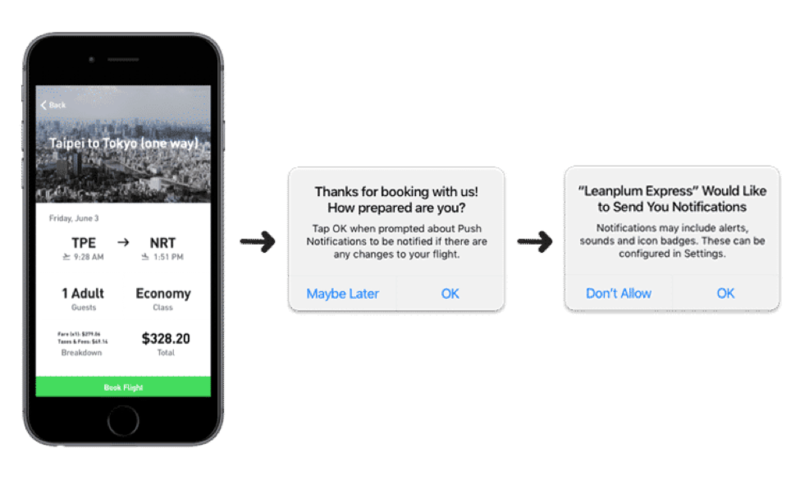 A series of recurring boost campaigns will help an app to increase visibility and prepare a launching basis for holiday promotion. Boost campaigns will also attract organic users. This is when you have to get your ASO (App Store Optimization) on point. ASO is crucial for christmas, if you are ranked on the wrong keyword and not visible to your audience, you will not enjoy and make profit of the christmas burst. It’s time for your app to reach top charts and shine like a Christmas star! Focus on volumes. Utilize a rewarded installs campaign on a self-serve platform. This provides full control over CPI and installs volume, is cheaper than premium traffic, and is perfect for burst campaigns. A rewarded installs campaign will help reach positive ROI through lower CPI and attracted organic traffic. The most common mistakes app developers make after reaching a desired chart position is not sustaining paid install volumes. Once you have reached top charts, try to maintain ranking with a sustained campaign otherwise it will result in a quick position loss. While many users continue to download apps on their new devices in January, the cost per install drops. Make this post-holiday calm work for you. Think about all the users who installed your app and have not used it for some time. Launch a re-engagement campaign to keep them interested and active, offer them new features and post-holiday discounts. Holiday season brings a lot of stress and rush to app developers. In order to stay calm and profitable, prepare your strategy in advance, set up your marketing priorities, and find a proper ad platform. AppBooster is a perfect tool to use for the holiday race. It’s simple, it provides rewarded installs from reliable sources, and it fits any budget. Get Your Free ASO Consultation to get Christmas Ready Here ! If you want to win in mobile, you have to win in apps. And if you want to win in apps, you have to win in search. But it is not easy: to get a top 10 ranking in your category on Google Play or the iOS App Store, you’ll need to rank for 60 to 110 search terms on average. That starts with a strong focus on App Store Optimization. We studied the top 50,000 apps on iOS and Android, including billions of ratings, reviews, and bits of metadata to find what’s different about top-ranked apps. Search really , really matters. For most mobile publishers, a massive 65 to 80 percent of all your app installs will come as a result of app store search. Apple says that 65 percent of all iOS app downloads come directly from search on the app store. Mobile ad network Fiksu says that 80 percent of quality organic Android downloads come from Google Play search. There’s a good reason for the dominance of search: people are extremely task-focused when installing mobile apps. Not only are Google Play and the iOS App Store very often the first place users recall seeing apps that they install, smartphone owners typically approach app discovery like a job to complete as quickly as possible. When we asked over 3,000 smartphone owners why they had downloaded their last few apps, 37% of them said they had a specific task to accomplish. Another 13.5% of them had searched the web for something they wanted, and Google had returned the app as a result. Put those two together, and you’ve got about half of app installs resulting from purposeful, intentional, directed search. So you’ve got to win search. But how? To win search, win ranking. If you want to be a top app, you have to win at Google Play’s and the App Store’s ranking algorithms. That means a lot of things in terms of app store optimization, but ultimately it means you need to rank for a large number of keywords that people search for. If you break it out by individual apps, your app has to rank for between 15-25 search terms in order to crack the top 150 apps in your category on Google Play. On the iOS App Store, you have to rank for more than 25 to crack the top 150, and to hit the top 10 you have to rank for over 65 terms. Android has a longer tail than iOS, for two reasons: there are more apps available on Google Play, and Google has traditionally been more sophisticated at crawling and indexing content, and at returning search results, so more apps rank for more terms. Apple, in contrast, relies more heavily on developer-provided content such as app titles and iTunes Connect keywords, which limits the diversity of terms an app can rank for. If you want to rank in the top ten apps in your category, you can’t just rank for many different terms, you have to rank first, second, or third for a lot of those keywords. This is the core challenge not for apps that are forgettable, way-out-of-contention efforts thousands of positions from the top in their category, but apps that rank 140, 152, or 137 in their category. Apps in the top ten get hundreds and sometimes thousands of times as many installs as these moderately successful apps, and it makes all the difference between pulling in millions of dollars of revenue each day or week, and pulling in maybe a $1M every two or three months. This is the scope of the challenge: apps that want to challenge for top-ten spots need to rank for between five and eight times more keywords, on average. Of course, averages are nice to see, but of limited applicability for your particular app in your specific Google Play or App Store category. The real question is: how many keywords do top apps in my category rank for? As you might expect, the answer varies wildly. Top apps in the wildly competitive games categories rank for easily 200 keywords each. Photo & Video is also extremely competitive, and Social is tough too. But less popular and less trafficked categories such Books, Business, News, and Weather are comparatively easier to rank in, with top apps ranking for 25 to 50 keywords in most cases. Within the massive games categories on both Google Play and the App Store, which house easily half of all mobile apps, similar principles apply: some categories are just much, much more competitive than others. Which is why you need to select your app’s category very, very carefully. The key is in knowing your competition and playing accordingly, taking your time is also critical. Increase your chances to boost your ranking and organic installs! Start now! While the importance of App Store Optimization in mobile app marketing strategies remains constant, trends are moving towards app discovery and retention. For this blog post, we decided to put 4 of the most favored 2016 ASO Trends in a nutshell. This summer, Apple announced to bring in-store Search Ads for iOS developers. Starting this fall, Search Ads beta is running on App Store for the United States. By introducing Search Ads, Apple tries to solve the discoverability problem of various apps on App Store. With over 65% of downloads coming directly from searches on the App Store, search is the most significant discoverability-method for apps. The concept of Search Ads should enable you to promote your app at the top of app store search results. This should improve user experience for customers searching for an app on the App Store and help you get your app discovered. Deep Linking already was a trending ASO tactic in 2015. But we all just begun to see how it affects the mobile marketing ecosystem. Deep Linking and App Indexing helps your app to get discovered more easily outside the app store. By getting your app into Online Search, you can drive downloads and re-engagement. And this is how App Indexing works: Using App Indexing, your app can get displayed and promoted as an app result on Google Search. If your app and site have similar content, you can associate them with each other. Google then can index your app to serve it in search results. People, who are searching for your content and do not have your app installed, they get directed to the app store listing. Someone, who searches for some specific content in your app and already has installed it, gets directed to the app itself. Another ASO trend, we recognized in 2016 is the increasing importance of app descriptions. While it was well known, that app descriptions are relevant for Google Play ranking, many app developers have ignored descriptions in App Store. In the recent past, however, the value of app description is rising again. Since Apple plans to attach greater value on keywords in description, the field is another important part for your keyword strategy. It can be noticed, that keywords in App Store descriptions have impact on your search ranking. Also Emoji can be spotted in higher concentration in 2016. A nice example of Emoji-use in app description is that of “Unispotter” on Google Play: Funny, useful for text structuring & addressing target audience – we like that. When there is a hot topic to discuss with app marketers in 2016, then it is app retention. Several studies showed that it is very common for the average app to lose 77% of its DAUs within the first 3 days after the install. It turned out to be normal, that over time, 95% of users “get lost”. This caused some critical discussions in mobile industry. What ASO Trends might we expect in 2017? All in all, we saw that App Store Optimization is dealt as a crucial part in mobile app business and will still remain a hot topic in 2017. Due to the worldwide growth in mobile device usage, also mobile app downloads are predicted to expand. As a result of growing smartphone and tablet industry, there was a growth rate of 52.17 percent in the years between 2011 and 2016. On the other hand this means app stores become more and more crowded. “Can your users find your app“, therefore, will become a question, app publishers will strongly emphasize in 2017.